THE FIRM Full-service firm with a strong IP practice. Has broad experience acting for a range of clients on trade mark, copyright, geographical indication, plant variety and patent matters. In particular, patent drafting, prosecution, filing and litigation is a specialism. KEY INDIVIDUALS: Clients enjoy working with Essenese Obhan, the IP team leader and a specialist in the nanotechnology, biotechnology, electronic and chemical sectors. 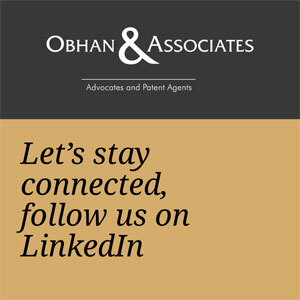 Obhan & Associates is a reputed, skilled and professionally managed law firm that was established in 2007. The Firm has been recognized for its expertise in Intellectual Property, Corporate Law and Litigation.